What kind of insight do party political manifestos offer for a People’s History of the NHS? In the 2015 election, political commentators raised the question of who actually reads these sprawling documents. It’s a fair point. Nevertheless, analysis of the language and content of the party manifestos that accompanied the 19 general elections between 1945 and 2015 can provide us with valuable clues, questions, and contexts for a People’s History of the NHS. The Encyclopaedia entry that follows makes 10 suggestions along these lines, based on a review of the manifestos of the two main political parties across the period. 1. Increasing Prominence: Who to trust on the NHS was a central issue in the 2015 general election, and this was reflected in the party manifestos. There has been a vast increase in the length of these documents over the past half century. The Conservative Party’s 2015 manifesto took 84 pages to put its message across, with a full three pages of text devoted to ‘Protecting and Improving the National Health Service’ and several additional pages adorned with pictures. Labour’s election winning ‘Let us Face the Future’ manifesto of 1945, which heralded the new welfare state, was delivered in just 5,000 words, and the promise of a new National Health Service in fact took up just two sentences. 2. What’s in a Name? The ‘National Health Service’ has had a presence in manifestos since its brief mention by Labour in 1945. But the Conservatives initially tended to turn to other expressions: ‘the Health Service’ in 1950; and ‘a national health scheme’ in 1951. They did deploy the language of ‘a National Health Service’ in 1955, but this language would once again be less prominent in their manifestos of 1959 and 1964. This was in contrast to Labour’s language. The marginality of the name in some of these early manifestos may remind us that the British people had to learn to understand and describe their new health system as the ‘National Health Service’. On the other hand, the difference between the two parties indicates that there was also a political and ideological dimension to this question of how to understand and name the new system. Perhaps even more noteworthy, given the way that the National Health Service had become more firmly embedded as a national institution a generation further into its history, is to see the term once again making way for ‘Health Service’ in the Conservative manifesto of 1987. By the 2015 election, party association with the name was crucial; looking back reveals that this has not always been the case. 3. Our proudest achievement. Labour’s 2015 manifesto claimed the NHS as the party’s ‘proudest achievement’. It had taken until 1959, a decade into the history of the NHS, for this message to come to the fore in a manifesto. Thereafter it would become a regular claim, running alongside accusations that the Conservatives would put the service in danger. Right up to the 1970s, Conservative manifestos, by contrast, focused more on the difficulties with the service and the need for improvement and reform. The dominant strategy was to focus on the faults of Labour in management and reorganisation, to raise the bogey of bureaucracy, and to advance the positives of a Conservative vision centred on greater patient choice. However, a shift of tone is evident from the 1992 Conservative manifesto, with a pledge that year that the party was ‘totally committed’ to the National Health Service. Then in their 1997 manifesto the Conservatives pointed out that they had been ‘the guardians of the NHS for most of its life’ (and indeed in terms of arithmetic this was the case, with 35 years in government, compared to just 14 years for Labour). By 2010, they claimed to be ‘the party of the NHS’. This perhaps made it even more important for Labour to assert their right to this title. By 2010, Labour’s manifesto claimed that they were not just the founders and main defenders of the NHS, but that it embodied Labour’s values and ‘belief that by the strength of our common endeavour, we achieve more than we achieve alone’. The NHS, in other words, was a symbol of all that the party stood for: care ‘at the heart of Labour’s values’. This voicing of such claims had become stronger over time. 4. Founded on the principle. By 2015, not just Labour but also the Conservatives were keen to assert their faith in the ‘founding principles’ of the service. Central in the talk of principles was the idea that care should be provided according to need rather than ability to pay. As the Conservative manifesto of 2015 put it, ‘no one should ever have to worry about their ability to pay for healthcare’. However, this language left some room for interpretation. It wasn’t the same as saying that all services and all medicine should be freely provided. To have said this would have been to ignore the earlier controversial sacrifice of the principle through the introduction of prescription charges in the 1950s, as well as ongoing concern about the degree to which some services and medicines were not available to all under the NHS. In fact, in the manifestos of the 1950s, right up to the 1980s, not just prescription charges, but also the ongoing place of pay beds within NHS hospitals, had provided a landscape for political battles over defending and restoring the NHS as a ‘free service’ (as Labour put it in its 1955 manifesto). By 2015, a focus on defending a free service had been put aside. We can see such a transition in the phrasing of Labour’s manifesto of 2001: ‘New Labour’, the manifesto asserted, ‘believes that the NHS needs radical reform to fulfil its founding principle of quality treatment based on need, not ability to pay.’ Here, the language of a comprehensive free service was downplayed; ‘need’ left scope for qualifying comprehensiveness; ‘ability to pay’ left scope for qualifying the idea of the free service. Moreover, the founding principle now embraced the ‘quality’ of the service, and this redirected priorities accordingly. Crucially, the prioritisation of quality (rather than a publicly provided service) left the door open for embracing the private sector as a provider if this meant better quality care. Ironically, the talk of believing in a founding principle that care should be according to need rather than ability to pay became more prominent after an acceptance of some sacrifice to the principle of free, state provision than it had been before. 5. A profound expression of our values as a nation. From as early as its manifesto of 1951, we find Labour pronouncing that the NHS was ‘the admiration of the post-war world’. Considerably later, in 1997, the Conservatives can also be found describing the NHS as ‘a British success story’. By 2015, NHS patriotism had become pervasive: for Labour, the NHS was ‘one of our great national institutions’; for the Conservatives, it was ‘a profound expression of our values as a nation’. Such language made support of the system axiomatic, yet also made it easier to be evasive about precisely what model of healthcare and what set of values had to be defended. 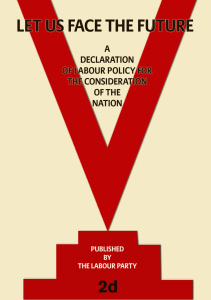 Previously, the language of the national had carried stronger political and ideological connotations, with implications of nationalisation, top-down control, and uniformity. As such, it had been more divisive. The language of national values also came to the fore at a point of heightened devolution and of growing political importance for nationalist politics. In that context, talk of the NHS embodying British values had additional significance. In this regard, it is also worth noting that that the distinct relationship to the NHS of each of the four nations of the United Kingdom (and the development of distinct systems of administration) was remarkably absent in the manifestos of both parties right across the period. 6. Patients. When it came to talking about the relationship of potential voters to the NHS, it was the language of the ‘patient’ that became increasingly central in manifestos. There had been alternatives. In the context of wartime solidarity, a language of ‘the people’ had powerful emotive appeal and it is to be found in Labour’s brief discussion of health in its 1945 manifesto. The Conservative manifesto of that year used the term ‘citizens’, again suggesting that this was a moment for thinking about the recipients of healthcare in terms of social rights. However, more central in the Conservative 1945 manifesto was the contractual language of the patient. ‘Nothing will be done’, reassured the manifesto, ‘to destroy the close personal relationship between doctor and patient, nor to restrict the patient’s free choice of doctor.’ This initial reassurance was directed at doctors as well as patients. As the medical profession came to accept the NHS, the focus shifted towards criticism that, as the 1979 manifesto put it, ‘too often the patients’ needs do not come first’. By 1987, the Conservative manifesto went as far as asserting that ‘the ultimate purpose of the Health Service is to serve the patient’. We here see signs of a fundamentally different vision of what the NHS stood for. Before the era of New Labour, the language of ‘patients’ had been less characteristic of Labour manifestos. As late as 1992 we find Labour promising to make the service ‘accountable to the community’. Intriguingly, it was for this reason that Labour manifesto of 1983 seems to have been the first to have deployed the language of the consumer, when it talked about the importance of community health councils in representing the ‘consumer point of view’. New Labour, like the Conservatives, tended to avoid the language of the consumer in their manifestos. The language of the patient was perhaps preferable as more politically neutral in advancing the case for greater choice. By 2010 even the Labour manifesto would present its thinking on healthcare under the title ‘a patient-centred NHS’. It is interesting to see how this language saw off a more overtly political language of the people, citizens, consumers, and users. 7. Leave it to the doctors. Manifestos have been a route for reaching not just those who used the health service, but also those who worked within it and those concerned about the interests of this workforce. As we have seen, the Conservative manifesto of 1945 looked to reassure doctors as well as patients. In the party’s 1950 manifesto it still addressed this issue, promising to strengthen the position of the family doctor and to restore the freedom to practise anywhere. In striking contrast, Labour’s 1951 manifesto used the image of ‘the dread of doctors’ bills’ in the pre-NHS era as a powerful legitimising image of the new service. As the service developed into a huge employer, Labour manifestos also made a point of expressing concern for the condition of all NHS staff. Its 1979 manifesto talked of giving staff more of a say in how the service was run. And its 1987 manifesto promised a fair reward for all staff. This was in the context of the Conservatives criticising industrial action by healthcare staff (as in their 1983 manifesto), and turning to staffing as an area to save money through greater efficiency and through contracting out of services such as cleaning and catering. In this period, the Conservatives also turned to management as a solution. As the 1987 manifesto put it, a large and complex organisation such as the NHS needed to be ‘run in a business-like way’. However this proved an easy target for political attack. Labour’s 1992 manifesto explicitly criticised the Conservatives for passing power to ‘accountants’, and its 1997 manifesto warned that the Conservatives were turning the NHS into a business. But then, as Labour assumed responsibility for the system and began its own efforts at reorganisation, it was the Conservative party, for instance in its manifesto of 2001, that took up the cry of less bureaucracy, more choice for patients, and the return of decision making to doctors. Just as support of patient choice was to become ubiquitous, so was the idea that the best people to trust were the doctors. Bureaucrats and red tape were easy targets. Because the political advantage of making such statements seemed so clear, it tended to be very apparent in manifestos. A very different story is to be found in the ongoing attempts of governments to reorganise the NHS. 8. Health. When the NHS was first mentioned in a manifesto by Labour in 1945, it was overshadowed by broader discussion of health, and specifically by the importance of care for Britain’s mothers and their children through children’s allowance, school medicine and food, better maternity and child welfare services, and healthy family life. Yes, a health service needed to be made available to all, but just as much emphasis was placed on good food and good homes which would ensure that ‘much avoidable ill-health can be prevented’. Labour’s 1945 manifesto had envisaged ‘health centres’ as being key sites within the new NHS, yet in reality the hospital assumed the position of institutional centrepiece of the new health service and this was reflected in the focus of post-war manifestos. Nevertheless, manifestos did continue to talk about the importance of broader approaches to the challenge of healthcare. In the late 1960s and early 1970s, the manifestos of both parties addressed healthcare as part of a wider discussion about the reorganisation of social services. In 1970, for instance, health was part of the Conservatives’ consideration of ‘Social Service Advance’. In Labour’s manifesto of 1966, healthcare was somewhat hidden away under the heading of ‘The Family in the New Welfare State’. And in 1979, Labour talked of making ‘A Healthier Nation’ through a shift in priorities from hospital treatment to care in the community, health centres, and supporting social services. One factor in such reorientation was the challenge of providing care for the elderly and mentally ill. Another was recognition that a focus on prevention might be the best way forward in lessening ill health. This was evident in the Labour manifesto of 1983, with its highlighting of health inequalities, but also in the Conservative manifesto of 1997 which called for more attention to levels of health and pointed to the Health of the Nation policy that the party had presided over. It has been common to criticise the NHS for being more of a national illness and hospital service, rather than a national health service. Even if this criticism is justified, it is interesting to note that right across the period the manifestos of the two major parties did in fact talk about the importance of an approach to the challenge of health that went beyond the hospital-centred NHS. 9. Two exceptions. If two manifesto statements on healthcare stand out as in certain respects exceptions to the general pattern of development it would be the Labour manifesto of 1983 and the Conservative manifesto of 2005. It is no coincidence that both came from parties out of power and facing governments that had fundamentally challenged and changed the political climate. The Labour manifesto of 1983 responded to the shock of the first Thatcher government, and to its apparent threat to the NHS through under resourcing and support of private medicine, with a mix of rejecting change and presenting a radical vision of its own. The former was unexceptional, in line with other Labour manifestos of the period; the latter is more interesting. In particular, the Labour 1983 manifesto stands out as the one instance (other than early Labour manifestos’ use of the injustice of the 1930s) in which a politics of health inequality was placed centre-stage. This was a fundamental challenge to the way that the National Health Service had been presented up until this date. Its emergence in 1983 owed much to the 1980 publication of the influential Black Report on inequalities in health. The fact that this emphasis retreated thereafter may tell us something important about the politics of health. It was one thing to talk of providing care free at the point of delivery according to need, another to open up the possibility that help might need to be targeted, and thus that need varied radically and was a deeply political issue demanding linked socio-economic action. This was not the only radical feature. The 1983 manifesto also placed an emphasis on women’s health (though this in truth reflected a broader response to feminism in Labour manifestos of the 1970s and 1980s). Again this was in tension with the dominant discourse of an undifferentiated body of patients. Finally, the 1983 manifesto proposed that government should take a major stake in the pharmaceutical industry, implying that the economic viability of the NHS was not something that could be addressed through health provision alone. Again, this was an issue that otherwise remained off the agenda of manifestos across the period. If Labour’s 1983 shows us the possibility of a more left-wing politics of the NHS, the Conservative 2005 manifesto offers some indication of a right-wing populism. The demotic, handwritten title of the section on healthcare – ‘I mean, how hard is to it to keep a hospital clean?’ – reveals much about its approach. The issue of cleanliness (bring back matron) played on the appeal of the standards and common sense of the past, but it also played on distaste for the NHS of the present. The subsequent warning about health tourism juxtaposed this morality of cleanliness with the politics of immigration. Record amounts were being spent, but people weren’t receiving value for money. As with Labour’s manifesto of 1983, this glimpse of the alternative politics of the NHS puts in sharp relief the fact that for all the significant difference between the public positions of the two major British parties on the NHS, both in fact moved towards a new centre ground in the period after 1979. 10. Crisis talk. The language of crisis – the NHS ‘under threat’ and in need of ‘rescue’ – which characterised the Labour manifesto of 2015, was far from new. However it has not been universal and there is a distinct pattern to its coming and going. It had always been more common from Labour, and for obvious reasons it tended to be a line of attack when the party was out of power. It became particularly strong in response to the long period of Conservative government after 1979. In 1987 Labour promised to end ‘privatisation’. In 1992 the Labour manifesto described the election as one that would ‘decide the future of the NHS’, determining whether Britain continued to have the kind of NHS it wanted. And in 1997, Labour warned that ‘if the Conservatives are elected again there may not be an NHS in five years’ time’. In the period of Conservative government from 1951-64, the Labour attack was a little less apocalyptic in tone, even if still very pointed. For instance, in 1955 it had focused on the ‘restoration of a free health service’, and specifically on prescription charges and the ‘queue-jumping’ enabled by private beds in NHS hospitals. However, this was presented as an attack on encroaching injustice rather than an end of the NHS. It continued in 1959 and 1964, though now with the accusation that the Conservatives were starving the NHS of adequate funding. The Conservatives were not immune from talking up crisis, but in their case this tended to be an issue of questioning the status quo of the public service rather than calling for its defence or restoration. In their manifesto of October 1974, they talked of the ‘acute difficulties’ in the NHS and the difficulty ‘even to maintain existing standards’ (and on this basis argued that it was wrong to reject the assistance of private beds within the NHS). This critique of the viability of the NHS as it stood was even stronger in the Conservative 1979 manifesto: standards were falling, there was a crisis in morale, and patients’ needs were being overlooked. Talk of crisis, as these examples illustrate, always had two very different derivations and implications. It could mean that the service needed saving. But it could also be deployed in critiquing the status quo and arguing for modernisation. Undoubtedly, the rhetoric of the whole future of the NHS being in question emerged as a powerful electoral card in Labour manifestos, particularly when it was out of power. But we should also recognise that the language of crisis could provide a case for modernisation that fundamentally challenged the nature of the service. The two coexisted in the manifestos of the period. Ultimately, the rhetoric of saving the NHS by protecting its original organisation did not prove defence against arguments to save it through, as New Labour’s 2001 manifesto put it, ‘radical reform’. As a consequence, when Labour talked of rescuing the NHS in 2015 this was a very different service to that which it had been defending in the 1950s and rescuing in the 1980s. It is interesting how the NHS becomes so politicised around election time, particularly given the context of some cross party consensus apon its founding. During elections it seems to be used as a political pawn to ‘get one over’ on the opposing party. I’ve grown up only hearing election debates on the NHS revolve around cuts, or essentially which party is going to cut less than the other. It seems around this period of such intense political debate the identity of the NHS gets most blurred : the day to day work of staff gets lost amongst the noise of economic policy and political barbs. It would make a nice change to hear a manifesto say something positive about what can be done to maintain and improve the service.